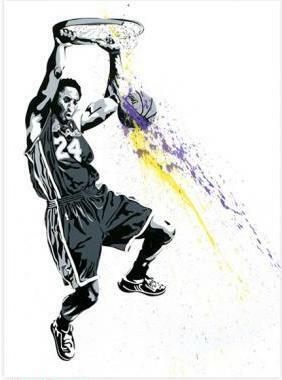 In celebration of the Lakers making it to the NBA finals, and tonight's Game 1 of the series, Mr. Brainwash presents this very limited edition print of Kobe Bryant. Screen print and spray paint on textured archival art paper. Each print uniquely hand finished. Signed and numbered by the artist. Edition of 25.